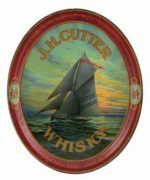 This is an Autocrat brand whiskey serving tray from the Edwin Schiele Distilling Company based in St. Louis, MO, 1910. 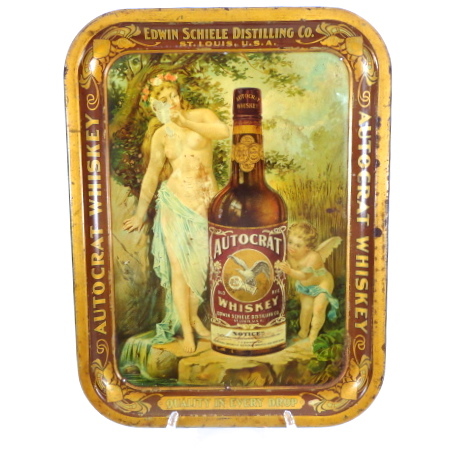 The tray features a mythical goddess and a smaller angelic cherub next to a bottle of Autocrat whiskey. 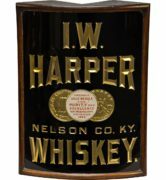 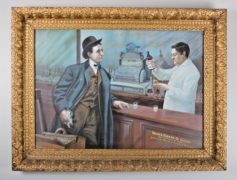 Mr. Schiele, a local whiskey manufacturer produced several brands of whiskey and the Autocrat brand was the largest seller. 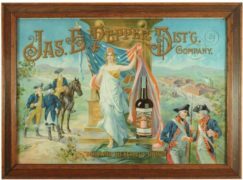 Other serving trays from the Schiele Distilling Company featured people playing cards and another version portrays Sir John Falstaff, a character in several William Shakespeare plays. 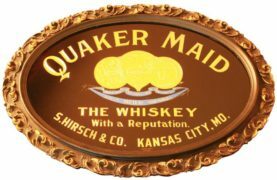 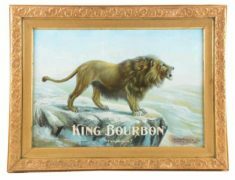 All of the antique advertising collectibles from the Autocrat brands are considered hard to find and desirable for collectors.